Crazy Black Friday Deal 2017 – Save $120 Off A Sonicare Diamond Clean Today Only! 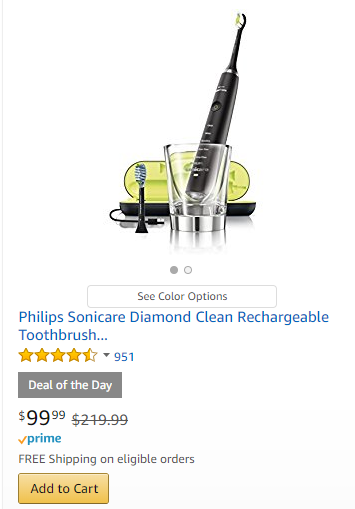 Today only you can get a Sonicare DiamondClean for only $99.99 regular price is $219.99 from Amazon. That’s just crazy I’ve never seen them this cheap before. This entry was posted in Philips Sonicare Coupons and tagged 2017, Amazon, Black Friday, electric toothbrush, Sonicare. ← 10 New Coupons With A Maximum Savings Of $50 off Sonicare Flexcare!